Last autumn, on a magical journey to the miles of strip mall wonder that is Merivale Road, I came across Crispy Chips while searching for a place for my wife and I to grab a quick bite. Some of the usual fast food suspects are nearby, but I wanted to give this chip wagon a go. Dating back to 1989, this family-run wagon predates the ongoing gourmet food truck trend by decades, with its location between Canadian Tire and Rona an artifact of feeding the blue-collar workers who frequent these stores for supplies. While this practice continues here and elsewhere with chip wagons and hotdog carts around the city, the clientele now includes yuppies like my wife and me. 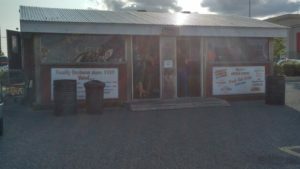 Their setup is a unique one – likely born from a combination of their popularity, and the unforgiving Ottawa winters – all the cooking is done in the trailer itself, while a covered shack houses the condiments and the queues for ordering and pick up. A handful of people were there when we showed up just before closing time, with friendly banter between the staff, regulars, and randoms like ourselves. The menu is displayed on a sizeable board next to the ordering window, offering lots of variants of a handful of base options. All your deep fried favourites are here – fries, poutine and onion rings, along with their natural pairings of burgers (both beef and chicken) and hot dogs. Some basic sandwiches— as well as mozza sticks and chili – complete your hearty, if not healthy, choices. We went for a medium poutine, a small onion rings, and a can of pop, which came to a very reasonable $12.25. The food was up in quick order, and we went out to the tables set up next to their food trailer/shack combo. I noticed right away that the onion rings were a really generous size. With a small cardboard cup at the bottom of a paper bag for support, there were probably 15-20 golden brown rings. 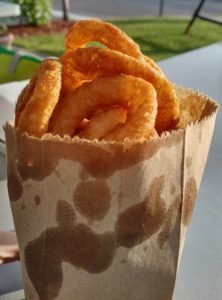 They were super crisp, and with onions that didn’t pull out on the first bite, they were some of the best onion rings I’ve had since my pub-going days in Halifax (RIP, Pogue Fado). I don’t know if they’re made fresh or from frozen, but I don’t care when they’re done this well. And at $3.25 for a “small”, they even beat out places known for their onion rings (*cough* A&W *cough*) on price, quantity AND quality. 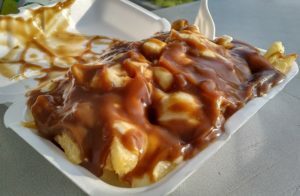 Ottawa’s favourite comfort food came in a respectable 4” x 8” container, loaded to the top with piping-hot gravy, cheese curds and fries. The poutine was brimming with a ton of curds, and the odd one that wasn’t melted by the gravy was squeaky fresh with a salty tang. The gravy had a rich flavour and wasn’t over-salted like many chip wagons’ gravies are. The fries were nice and crispy, and they held up impressively well to both the hot mess that was on them, and the time that it took to eat the whole thing. All told, my wife and I were (A) really full after eating all this food, and (B) really impressed with the quality for value, especially at an innocuous chip wagon in a hardware store’s parking lot. If you’re in the Nepean area for shopping, or just driving through, skip the chain restaurants and forgettable masses of pizza and shawarma joints, and hit up Crispy Chips for the great food that’s kept them open for nearly thirty years.